Google's Realtime Search will come in handy for just about everyone no matter what your interests are. Suppose you want to see what retreats are happening this weekend? Use Realtime Search and type in what you want to find! Click Search and view the results... easy! Want to find a new meditation group or center to go to tonight? 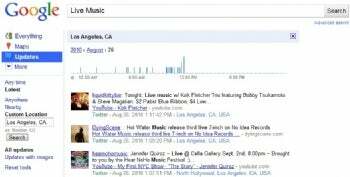 Use Realtime Search to see what is happening around you. Want to find some live music or something different nearby? Use Realtime Search to quickly see what's around. New For You - Spiritual & Material Wealth Guru Custom Search! New for you on this site...the Spiritual & Material Wealth Guru Custom Search Engine! It's on the top of the right hand column. Ask it anything... it will find the answer! The Spiritual & Material Wealth Guru answers all your questions from the top experts in the area of Spiritual Growth, Material Wealth and Personal Development. You can also now search this site Wealth ~ Abundance ~ Joy NOW! for specific topics and answers to your questions. The search box is further down on the same side.